welcome to the Stamp of Approval Lovely Notes Collection Blog Hop - I am super excited to be a part of the action! Be sure to leave a comment below for a chance to win a collection for yourself! Three kits are being given away so check out Day 1 and Day 2. 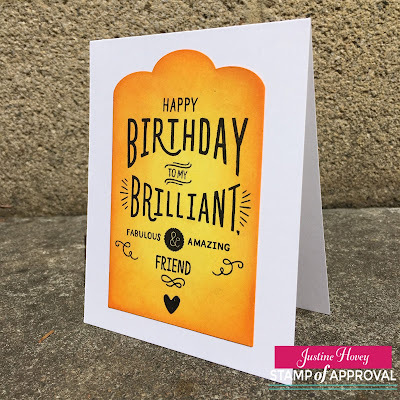 Stamp of Approval is a collection of products (stamps and dies) that work fabulously together but they’ll also work incredibly well with supplies you already own. The collection goes on sale tomorrow so be sure to keep your eyes peeled and be on the waitlist so you don't miss out - it sells out fast! The first card I created, I also made a video tutorial for - I used several of the collection items - Butterfly Notes and Lovely Flowers Stamps and Dies to create this elegant vellum card. For more details, check out the video below and don't forget to subscribe to my YouTube channel! I had a lot of fun playing along with this versatile collection and I created several cards. These are the ones that made the cut though. I absolutely love the bright colours! How amazing is this die!? Thanks so much for coming and visiting my blog. I look forward to hopping along with the others and seeing all the stunning creations! Love that die as well, fellow Canadian!!! Great colour and cards! those butterflies are so pretty! really like the colors you chose! Lovely card, I can see why you love that embossing powder, it is gorgeous!! I love the butterflies, beautiful card!! Your cards are stunning it has been an awesome hop, thanks! They are all beautiful, but that blending on that last card.....AMAZING! Very pretty cards. I love the collection! They're all lovely, but my favourite is the butterflies on the dark background. All the cards are lovely! Great job! I love all your cards and yes that die is amazing!!!!! I was happy to see that you are part of the hop. I watch you videos all the time. Thank you for sharing your beautiful work. Gorgeous! I love the bright cheerful colours! Love all the cards you made but especially the birthday card. So bright and cheery. I'm so loving the thank you card with the butterflies!!! Beautiful, beautiful card! Love the embossing color for your butterflies!! Great cards and great ideas!! lovely cards! I really like the rose gold embossing powder! Very pretty. You are so creative. Pretty cards. I like the rose gold powder...I don't think I've ever seen it. WOW - - this is wonderful showcase of several techniques. So Cool! Love all the cards. Great use of the kit. Love the white on white effect! I like all your cards, but the butterflies are just stunning. Thanks for sharing the video. The butterfly cards are fantastic. Great cards thank you for sharing! Great card. I like how the butterflies float across the card. And the use of vellum. And the embossing powder. A perfect trifecta. Beautiful cards, Justine! I really like the butterfly one.. the contrast is gorgeous. Love your cards! Can't wait to play with this collection!!! Very pretty cards! Love the butterfly card and that concentric circle die is pretty sweet too!! These are beautiful. I love the big birthday sentiment and that die is amazing! Such wonderful creations and your techniques are simply gorgeous!! All of your cards are gorgeous, but the butterfly card is my favorite... outstanding and awesome. Thanks for sharing. I love your cards! Thanks for sharing! I'm coming to Edinburgh in Sept! Yay!!! I had to go in a round about way to get here but it was so worth it. Beautiful cards! I couldn't miss this stop on the hop! Fantastic! All the cards are gorgeous! Oh so pretty! Fab cards!! I especially like the butterfly card with the black background. The black background is stunning. We need a video. Beautiful cards! I love your butterfly cards and the awesome Concentric Circles card! That die is awesome! Oh my what beautiful cards. I especially what you did with inks on the large banner card. Thank you so much for sharing. I can't wait for tomorrow to get mine ordered. Just love all your cards - thanks so much for sharing! Your vellum card is simply elegant. What a great use of many of the kit items. I really love all your cards! Thank you for sharing a video too! Nice use of the die sets! Great inspiration! I love the butterflies peeking out of the black background. Justine, you always impress me with your card creations. All your cards are beautiful. Beautiful cards, Justine! The embossed butterfly card is fabulous! Your first card has left me breathless! Absolute perfection!! The rest are also quite lovely, especially the third one!! Butterflies always steal my heart!! LOVELOVELOVE!! TFS! The butterfly card is stunning! Nice work! Wow! You have some mad blending skills Justine! These cards are gorgeous!! Great video too, I'm totally in love with your butterfly card done in rose gold. Wow!! Beautiful cards and great designs. I'm going to be brave and try embossing on vellum thanks to your video. What colors did you use on your concentric circles card??? I love it!!!! Love the vellum butterfly card. So creative. Hope to win this collection. Everything in it is awesome. Really like all three if your cards, The butterflies on the vellum are beautiful with the rose gold embossing powder. Very pretty variety of cards using this wonderful kit. I love your card creations. Very classy looking. This SOA release is fabulous. Thanks for sharing and have a great day. All your cards are beautiful, but I especially drawn to those lovely butterflies. They looks like they are actually flying. Love your cards thank you for sharing! Your cards use some rich colors including embossing powder. Love your fabulous cards with the great design and pretty colors! Just Beautiful!....I love the colors of the Butterfly Card.....Thanks for sharing your ideas with all of us! I love how you work with vellum. I have always loved vellum and it seemed to disappear from the market for awhile. I am so glad its back and you are giving me ideas on how to use it with the new SOA set of goodies. I was so excited to see your name on the hop! Love all of your cards! Oh and I had my daughter watch your video on how you create a card making video and she's watched it a dozen times. You packed a lot of info into it to help her with making her own videos. Thanks again! Those are gorgeous. I just decided I must really love butterfly cards - those are my fav in this batch. Thank you for the informative video. Can't wait to order my kit! Great cards. Thanks for sharing your talent. Beautiful cards, love all the inking and coloring. The butterfly one is gorgeous. Such creative cards, love them all! What a lovely card! Yours always so neat and pretty. Thank you. All very different cards, and all equally lovely. Nice collection of different styles. I get stuck and start churning out the same old thing. Thanks for the ideas. Great cards! I'm loving those butterflies! What an amazing collection! Great cards! Thanks for giving us ideas and increasing our excitement while we wait till tomorrow to order!! The first butterfly card absolutely won my heart! It's beautiful in so many ways. What talent you have. I love the cards and techniques you used. Thank you for sharing them! The butterflies & the dies card are my favourites. Kudos to you! Your cards are amazing. I love your color choices! Pretty cards, love them! Thanks for sharing. Love them all, but the white butterfly card is stunning. As always I enjoy your videos. Pretty cards, especially the butterfly card with it's dark background. Your cards are lovely! I love the butterfly card! Thanks for the video! Justine, I love love love the butterfly card as well as the one with the concentric die. All the cards are awesome. Was so excited to see what you were coming up with. Nice to see the chevron banner in the one card! 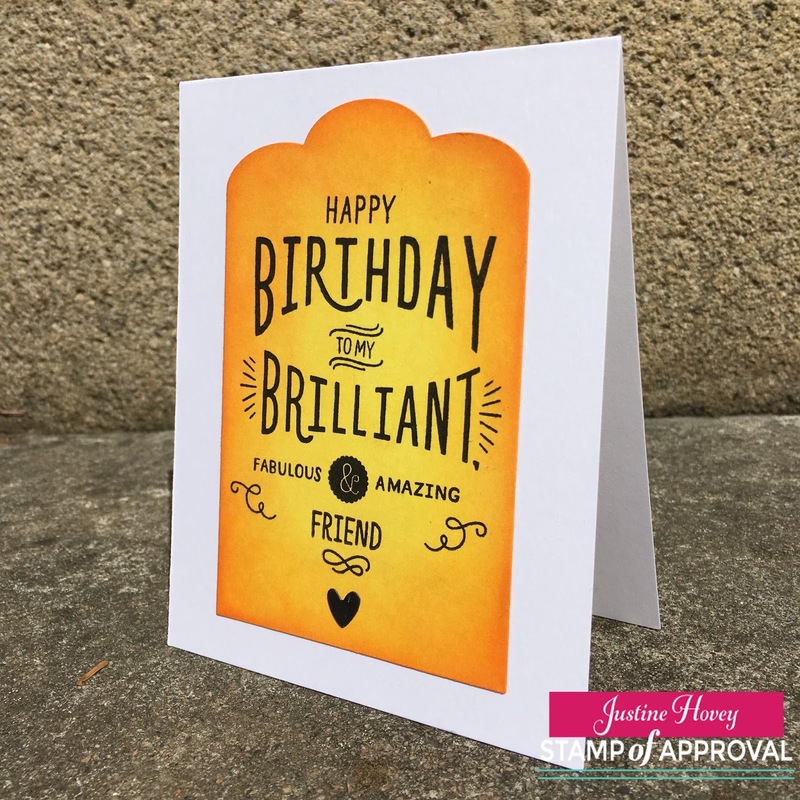 Love the gradations of gold on the fill in the blank "brilliant" birthday card! I love the blog hop and your stamps are beautiful! Can't wait to use this set! As usual, I love your cards. Now to view your video. It will be in my subscription list on youtube. I love what you make. Gorgeous cards but my favorite is the butterfly one you did the video on. I love butterflies and flowers. Your cards are beautiful! I'm seeing such wonderful inspiration on this SOA blog hop! Awesome cards and love your videos. Thanks for sharing your creations. Beautiful cards. The butterfly card is simply gorgeous. Thank you. All I have to say is very beautiful cards, I can't just pick one card. It will be fun to reproduce each card. Wow! Never would have thought to leave the die cuts white and Not stamped. Like that look. The first butterfly card is stunning. Love all of the cards you did. Gave me lots of inspiration. Terrific cards - my fav is the card with the dark blended ink background - it really shows off those great butterflies! Thanks for the opportunity to win this amazing Lovely Notes Collection! As always, Justine, the cards and the video are terrific! Justine! You've been quite busy! I love all your cards but my favorite is the butterfly card with vellum. I love that you didn't stamp the flowers. Only 1 more sleep!! I love all four of your cards. Your choices of color are very pretty! Thank you! Love the colors you used in these cards. Bold but classy. Enjoy your video tutorials! Your cards are so lovely! Thanks for sharing! I absolutely LOVE that white and rose gold card! Your butterfly cards are gorgeous - I am just a sucker for butterflies!!! Justine .... what an inspiration you are. Love the butterfly card; so elegant with a vintage feel. Any chance you could do a video for the black background on your other butterfly card. Totally stunning. Stunning cards! Great stamps and dies to work with. Love the butterflies and the background! The butterflies are just, well, awesome! The concentric circles are amazing and I love everything about your cards!! Beautiful butterfly cards - interesting background on the second one . I love the concentric die and your interesting card using it . thank you Justine for sharing and for the inspiration . Your vellum card is so elegant. Love how your Brilliant Birthday card "glows". Love your butterfly colors and the amazing job you did on the coloring of the concentric circle card. Really nice job. I really like the rose gold embossing powder. All your cards are lovely. Womderful cards. Cannot wait for my box to arrive. I can't pick a favorite...love all of your cards! So happy the collection is available tomorrow ! The waiting is the hard part! Beautiful cards Justine-I love them all! These are simply stunning cards. I love them all! Gorgeous cards! Love the colors you used with the concentric circles! Really fabulous mix of card designs. Thanks for sharing a video with us. Some lovely cards, here! You are the last stop on the hop, but you have made some unique creations with the SOA supplies. The copper & vellum card is so elegant, and I love the bright orange tag. The concentric colour really focues the eye on the birthday message in the centre. Beautiful. I love the butterfly watercolor card. Showing us your wonderful talent once again, thank you for sharing your ideas. Justine, I just love all the colors you choose and how you put them together! ALWAYS making me drool with your CREATIVITY. Such awesome cards, Justine! Love the bright colors and fun designs. Justine, all of your cards are lovely! I really love the vellum Butterfly card, so pretty! I like how bright the Birthday card is with the yellow. The 3rd card with the Butterflies is pretty with the dark background. I love the bright colors on the Concentric Circle card and on the simple white background...BEAUTIFUL! Butterflies that flutter by.....vellum makes the delicate feel of this card. Wow! Love all the different looks you've created with this collection! I love that you are living in the UK. I've noticed that styles vary all over the world and I love your style. This was my first time stopping by your blog and I enjoyed staying a while. I think your color choices were bold and cheery - probably brighten up a dreary day in Edinburgh. I think I really responded to your artistry in blending and how fresh and bold your cards were as a result. Thanks for sharing your cards. You have created 4 very different but lovely cards with the collection. I love the creamy white / goldish butterfly card. I'm a sucker for butterflies. Keep up the wonderful work:) thank you. Love the butterfly card, the others are great too! Awesome cards. The first is so elegant and the rest so bright and cheerful. Love what you have done. Thanks for inspiring me. Gorgeous cards! Really great to see the variations that can be made with the sets. I love that bright background on the card with the fill-the-blank birthday stamp. So pretty! These dies and stamp sets are wonderful!!! Can't wait to get them!! Butterflies are so great on a card. All great cards. Great cards! Great use of the collection! Gorgeous cards! I have been looking at the rose gold embossing powder for awhile. I think I'm going to ave to order it now! I love the look on the vellum! I also love the background on the other butterfly card. I has a mystic feel to it. Just so pretty! (hopefully) before my SOA box arrives at my door. Wow, such beautiful cards, Justine! Those bright colors are fabulous!! Beautiful and unique cards. Love your use of color, thanks for the great inspiration! Beautiful cards. I love the one with the bright yellow banner. Beautiful cards Justine. Thank you.